Can we fix the inaccuracy in the Help Center's article on duplicates? The original question must have an answer; you cannot mark a question as a duplicate of an unanswered one. 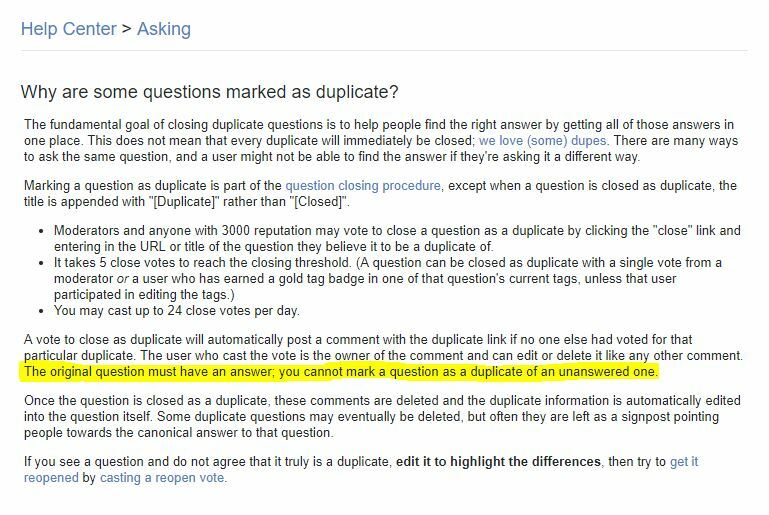 While this is generally true, moderators can close questions as duplicates even if the original question does not have any answers. Can the statement be modified to reflect this? The original question generally must have an answer; questions may only be marked as duplicates of unanswered questions on meta sites, when the questions share the same author, or when closed by a moderator. Not the answer you're looking for? Browse other questions tagged bug status-completed help-center duplicate-questions .